This historic marker stands in front of historic McCrory’s Five & Dine, where on Feb. 12, 1960, black students from Friendship Jr. College in Rock Hill were denied service at the lunch counter but refused to leave. 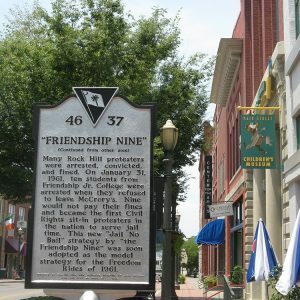 On Jan. 31, 1961, 10 students from Friendship Jr. College were arrested when they refused to leave McCrory’s. Nine would not pay their fines and became the first Civil Rights sit-in protesters in the nation to serve jail time. This new “Jail No Bail” strategy by the “Friendship Nine” was soon adopted as the model strategy for the Freedom Rides of 1961. The restaurant closed in January 2019.